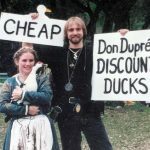 Discussion in 'Release 59 Events' started by MelfromHell, Nov 6, 2018. 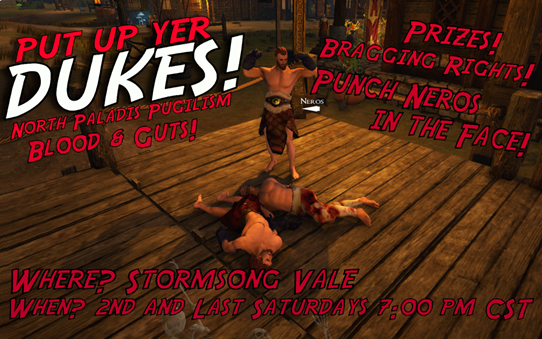 Come join us for some North Paladis Pugilism, THIS Saturday, November 10, 7:00 PM CST. Message Church here on the forums, on Discord (Church#4018), or mail Church in game. Fionwyn Wyldemane, Sean Silverfoot, DarkStarr and 4 others like this. Gauntlets of Lead (will be provided if necessary) and Light Armor Pants/Kilt only - No weapons allowed. No buffs or debuffs or healing allowed. Only the Trip skill is allowed on the contestant’s bar. Rounds are 30 seconds 3-5 rounds long. A KO is an instant win. Aw ya. Let's do this!